I always make a point of not seeing trailers to movies I want to see, and always recommend other people avoid them as well. Too often does movie trailers reveal way too much of the film's plot, including spoiling the whole ending. 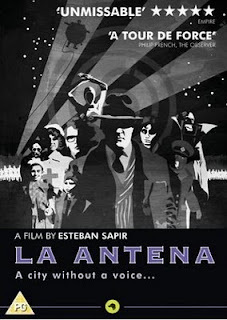 But with this Argentinean nod towards the golden age of silent films, I will have to make an exception. Its visual style and concept is such a different experience, describing it would never do it justice. Suffice to say that the black and white feature is a semi-silent sci-fi steampunk, where all dialogue is depicted through creative use of subtitles, which move around the screen along with the characters. Although the story is not a bad one, what little you might be able to catch from the trailer does not matter much, and in no way functions as spoilers. For this film is not something you devour only to fill empty time. No. This is a delicacy you will enjoy for its appearance, taste and feel.